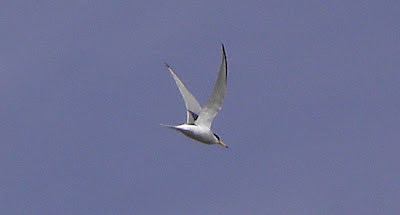 The Little Tern is the smallest and one of the rarest species of Tern in the UK - it requires undisturbed shingle on while to nest which is difficult to find in this modern age - with dog walkers and the like disturbing them preventing them from nesting, and as a species which is a notoriously poor breeder this is a bit of a problem. They are much smaller than other terns found in the UK, and the telltale sign is their yellow beak with a black tip which gives them away. A charming little bird, the best places to see them are protected sites where fences keep them safe from predators and humans.